Twitter is one of the most popular platforms for sharing random missives and information. The mini announcement platform is popular among all types of people from all walks of life. The only downfall is that you can’t always get your point across in 140 characters or less. 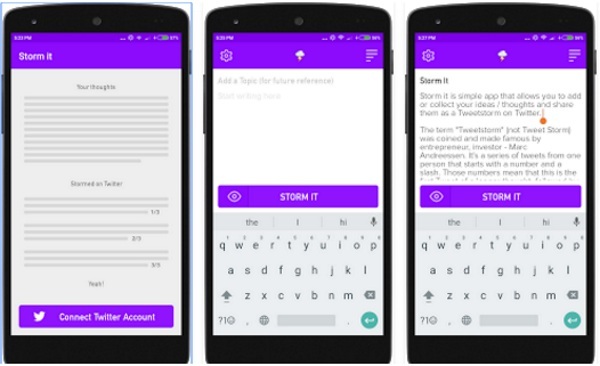 If you need to say more, check out Storm It, the app that handles your tweetstorm for you. This app lets you type out your story/rant/what have you and automatically adds the #/ to the tweet to keep the organized for posting. You can preview the storm before you post to make sure that it goes through in a readable manner. All tweetstorms are saved as drafts so that you can go back and edit them as you wish, provided that they haven’t been tweeted yet. That way you compose your thoughts, check for spelling, rethink your choices, etc. Storm It is a free app through the Play store. They did recently have some issues with the Twitter API but have allegedly solved them. Give it a try if you have more to say than the allowed character limit. Sounds like an interesting little app. But so far I was not able to send anything. All I get when I try to Storm it is : “Please try again later”. And from the comments I can read on Google Play, I’m not the only one. No mention of this in the app’s FAQ. So if someone here reads this and knows a way to fix the problem I’d be eternally grateful and I will worship you (eternally). P.S. : I thought maybe it was because the app didn’t like the fact that my Twitter account language was set to French… but nope. I switched to English and still can’t storm it.